DANNY HOLLOWAY presents the 3rd Edition of BLAZING 45s. The is now a monthly, taking place on the 2nd Saturday of each month at Nola’s Restaurant & Bar in the Arts District of Downtown Los Angeles. 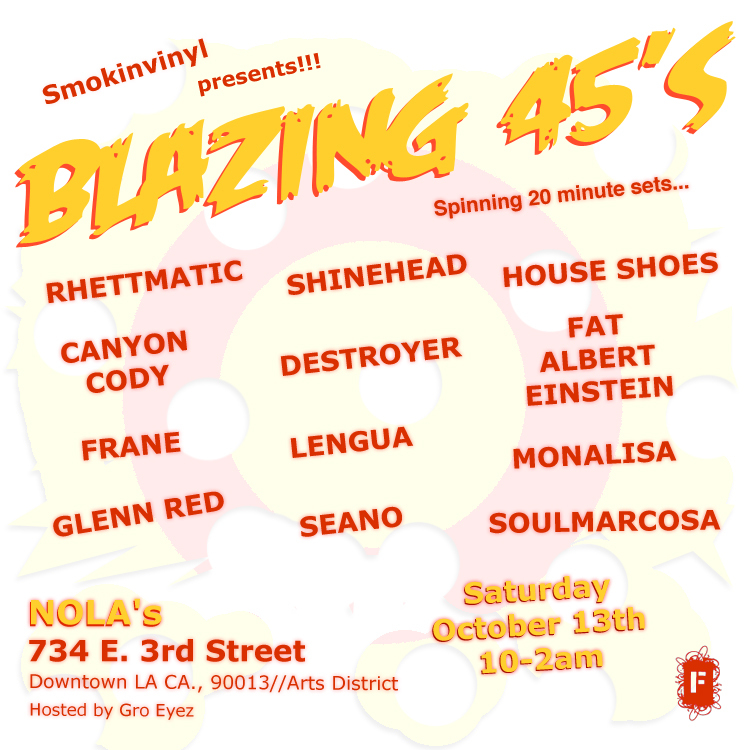 RHETTMATIC, SHINEHEAD, HOUSE SHOES, MONALISA, CANYON CODY, DESTROYER, FAT ALBERT EINSTEIN, FRANE, LENGUA, GLENN RED, SEANO & SOULMARCOSA will spin 20 minute sets of 7 inch 45rpm vinyl. BLAZING 45s is hosted by KPFK presenter GRO EYEZ and coincidentaly, it’s his Birthday on this night. So, for FREE admission mention GRO EYEZ Birthday – otherwise it’s $5. The restaurant serves full menu of New Orleans food till 10:30 and appetizers till one am. Full bar w/ drink specials. BLAZING 45s T-Shirts will be available for $10.